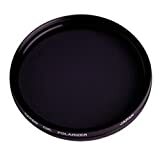 A circular polarizer has the same effect as a polarizer and is used on cameras with beam-splitting metering systems commonly found on autofocus SLRs. Not the greatest thing out there, but works. I have been using this filter with my Canon Rebel XTi and 17-85 mm USM IS lens. My expectations have been ruined. I expected to see bluish shade when photographing the sky. This did not happen. 1> Sun reflecting on the snow. 2> Sun reflecting on a water-body. In both these cases, the filter made a difference, (i couldn't call it remarkable). I've been successfully using this polarizer for a couple of years now, and it's been great when working with water and glass. When taking pictures of museum exhibits behind glass, this filter prevents the subject from being obscured by reflections. Taking pictures of fish through water presents a similar challenge, but with the filter I am able to focus beyond the surface. It works fine, but don't expect too much. I put in on my canon EF 70-200, F4L. The blue-sky effect is very little if exist at all. Why do I always try for value over quality? I returned the filter because it was used, old (ancient packaging) and had scratches and fingerprints on it. It was advertised as new. All this is a seller thing, and not the filter's fault. The filter, though, was very weak. That is, I doubt it would take my glass down 1/2 stop-seriously. I also noticed (without mounting it) that when used on an LCD monitor for testing, it was very weak at rejecting light at 90 degrees. That is to say, the effect was very weak. In addition, the filter's outer glass just spun freely. How would I fix that? Baddest piece of glass I could find! Brass rings instead of the aluminum ones in Tiffen and Hoya, and a calibrated wheel with markings make this the choice. There comes a time when checap is just too expensive. I want to make my L glass better, so why would I put layered/laminated glass over it? If you have a cheap lens (at 77mm? OK, whatever! ), then this might really be a value. 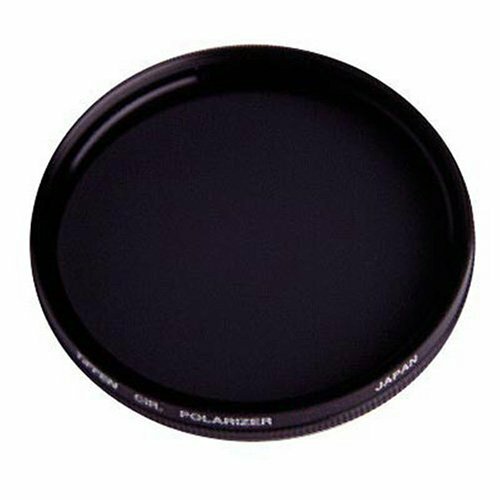 On the other hand, if you know what a circular polarizer even IS, you probably should be buying the best. The filter was shipped in an open plastic box, no plastic bag to wrap the filter. The filter was quite dirty when it came. Bought 3 Tiffen filters and all three are like this. On my 30D, the lens caps do fit this filter, but they don't catch very much of the thread (maybe 1 or 2 threads). This isn't a problem, but if this filter was on my lens ALL the time I might not like the fact that it doesn't fit all the way to the bottom.